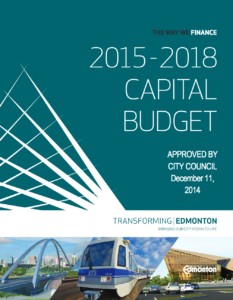 Edmonton was the first major city in Canada to launch a Vision Zero program. This all started in Sweden as a goal to reduce the number of deaths and serious injuries in roads to zero, hence the name. For three years the City of Edmonton has had a team working on how we can change the ways our roads flow and connect in order to save lives. Their plan to actually eliminate deaths on city streets? Will be ready later this year. That’s right, three years in and City staff tasked with reducing deaths on Edmonton streets have yet to put together a clear plan on how to make it happen by an actual target date. Another girl is critically injured. Two and a half years after starting work, there will soon be a clear work plan with targets. And that’s just while this current discussions are happening. 27 people were killed on Edmonton roads last year. Sure, it’s fairer to say we’ve had a vague Vision Zero plan for three years than no plan at all, but if the point of the program is to get to zero and we haven’t laid out how we’ll do that, well, that’s basically not a plan. And the places those two teen girls were hit by drivers? Just two of the 659 crosswalks the City knows are dangerous but refused to improve quickly, or sufficiently. We’re told it will take 27 years to fix up the crosswalks and make them safer. It would cost about $62-million to make this happen, by the way. I’m not saying you take the money from those specific program to install crossing lights and signage at all our dangerous crosswalks and tweak the curbs and lanes, but it certainly doesn’t seem like much money when you compare it to most things in the City budget (including random items I just looked up). You could also fund all the crosswalk work with a one-time tax increase of less than 0.5%. (I’m comparing numbers to what we’ve been paying for neighbourhood renewal.) You could get this work done in just a couple of years. And that’s not all this city council is dragging its feet on! City councillors also don’t want to talk about reducing speed limits on neighbourhood streets. And they aren’t sure slowing drivers down near all schools and playgrounds is completely necessary. So, while people get into collisions that will kill and change many lives forever, our city council and City administration refuse to act. But you could make them act. If you think basic crosswalk safety is important, get in touch with your city councillor. 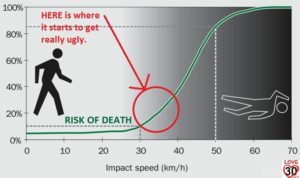 If you would like people to drive by your home at a speed widely accepted to reduce deaths to near zero in a collision, get in touch with your city councillor. If you want changes to your sidewalks and streets to make them safer for everyone, get in touch with your city councillor. If you don’t know who your city councillor is, you can also let the mayor know how you feel. And if you want to tell your councillor AND the mayor, you can do that too. 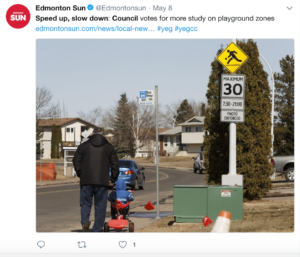 It appears that Edmonton’s Vision Zero plan is little more than marketing at this point, so let your voice be heard at city hall. This city council has let it be known they don’t feel like they’ve got enough information to make decisions about speed limits and traffic safety, so give them some information. Tell them what you think they need to do to save some lives. What does city council need to do? I think it starts with reducing neighbourhood speed limits to 30 km/h. Then start re-painting lines on the road to narrow lanes, which is proven to slow drivers down. 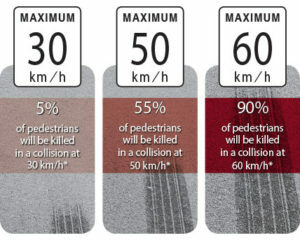 Then make sure any neighbourhood renewal construction incorporates a 30 km/h design speed, with plenty of traffic calming measures and pedestrian improvements like curb extensions, raised crosswalks and intersections, and changes to traffic and crosswalk signaling (and put in some bike infrastructure too). 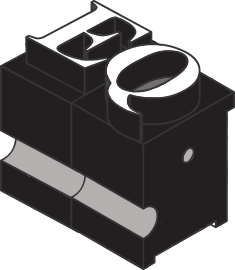 Queen Alexandra residents lead the way on this and it’s an easy way to leverage the $30-$40-million or more being spent in a handful of neighbourhoods each year. Fix the 659 dangerous crosswalks. That’s about $94,000 per crosswalk to make sure it has signage and paint and lights and a button for pedestrians (and narrow those lanes!). There are crosswalks and intersections that will need more work to improve sight lines for drivers and maybe even some physical alterations to curbs and sidewalks, but that’s pocket change for one of the core responsibilities in a $4.6-billion budget (that’s the combined capital and operating budgets). 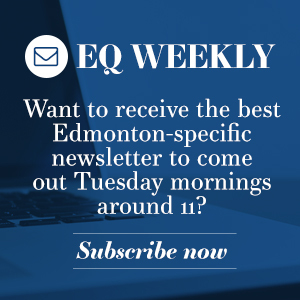 There are many more things that could be done to improve safety on Edmonton streets for all travelers. We are far from the only city thinking about this, and many have already done plenty to reduce deaths. If we can’t convince this city council to slow people down and let them cross the street safely, however, I don’t have a lot of hope for really forward-thinking traffic improvements. Let them hear you at city hall.